Crestron Electronics, a world leading company in the field of workplace and enterprise technology, demonstrated workplace communication solutions powered by its strategic partnership with Appspace at the recent ISE 2019 trade show. Crestron’s displays at the world-renowned show showcased the easy-to-deploy combination of Crestron hardware and the Appspace communications publishing platform. That combo makes it possible to keep employees and guests informed and engaged via digital signage, collaboration displays, and information kiosks. 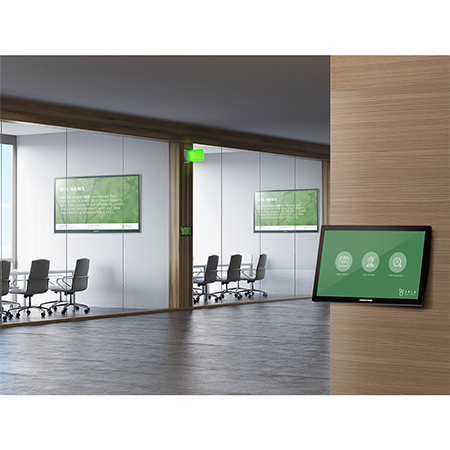 Crestron 7″ and 10″ TSW touch screens can also natively run Appspace scheduling software, to provide wayfinding for employees. According to Crestron, the teaming of their hardware and Appspace software empowers employees by making the information they need readily available, and by making collaboration, room scheduling, and wayfinding easier. The partnership, too, provides various solutions for corporate guests. Integration of Crestron and Appspace technologies can offer informative and engaging digital signage in waiting areas, along with a swift “self-service” kiosk solution for visitor registration and issuance of security badges. If you would like to discuss your requirements for Crestron workplace solutions please call us on 0800 195 4825.